The Bank is considered to be one of the cornerstones of Saudi Government. As It is a financing industry that grant loans for citizens, to enable them to contribute to the construction of this generous country. Currently this bank has more than 2 million loans across all Saudi Arabia regions, and this number in the progress to be duplicated within a year. The desired goal from creating this bank, unfortunately was not accomplished because of the time taken in the processes the loan application and approving it. The time needed to reject or to approve a loan used to take 6-8 months which was a pain-touching point to requestors. Another important factor was the collecting the payments from the citizens, because the collection module was not going through a clear process to ensure that all payments has made to the bank. The structure of the SCSB services is shown in the figure below. SSSIT found the cause of SCSB process leaks which was the cooperation between the team, BPM social help them out to assign the responsibilities between the teams and enforce the work rules to grant loans to Saudi citizens. 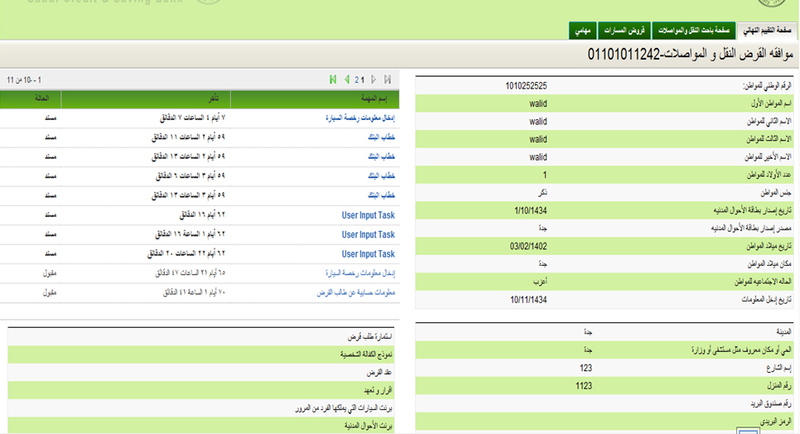 Through a clear defined process, all loan applications will be submitted through a web interface by the citizen himself, who will save the time for both parties, BPM rule engine will check the rules automatically and integrate to the Saudi GSB to ensure that all of the submitted information were submitted correctly and in few seconds the initial approval will appear to the citizen. The application cycle will go forward through the different departments and almost in the same day the applicant will know if the loan Application were approved or not, through BPM web interface, BPM Mobile or SMS received to his cell phone. The collection Module will immediately start collecting the payments through a state of art process, clear and integrated to the accounting and payments systems, no payments can be made without going into the collection rules.